Demand for membranes in the US will rise 7.9 percent per year through 2018 to $6.2 billion. Microfiltration will remain the largest category, while pervaporation will grow the fastest. The municipal water treatment market will be driven by replacement demand and desalination plants. The ultrapure water and wastewater treatment segments will see the fastest gains. 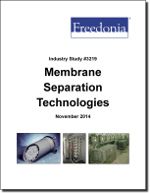 This study analyzes the $4.2 billion US membrane industry. It presents historical demand data (2003, 2008 and 2013) and forecasts (2018 and 2023) by material (e.g., polymeric, nonpolymeric), type (e.g., microfiltration, reverse osmosis, ultrafiltration, pervaporation, gas separation, nanofiltration) and market (e.g., water and wastewater treatment, food and beverage processing, pharmaceutical and medical uses, chemical processing, industrial gas processing). The study also considers market environment factors, details industry structure, evaluates company market share and profiles 37 industry players, including EMD Millipore, Pall and General Electric.